I’ve cut my office hours, so my desk is starting to clutter again. Back when I was handling the children full time, I didn’t have a lot of time in my office(s), so I’d drop things onto the wings of the big corner desk I have, and the piles would get several inches high. When I had a full time contract a couple years back, the desk was pretty tidy. But the desk is starting to accumulate things on the margins, out of peripheral vision when I’m looking at my peripherals. So to shame myself I am pointing out some of them. I could go with a list of five (or more) things I’ve already blogged about, including tickets and the playbill for Black Comedy, an Ideals, a couple copies of Battlestar Galactica and a drawing I got in Saint Charles, and even an Afghani currency I previously posted about in a Five Things on My Desk post from 2012 (although instead of a Trinidad and Tobago dollar, it’s partnered with a Somali bill that I don’t know where I got). But, no, I won’t take the easy way out. 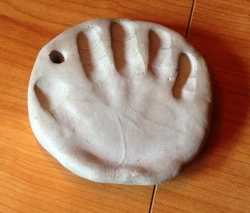 A plaque with my hand print that I made in kindergarten. I kept it out while digging through a box of mementos because I thought about hanging it up, and I’ve yet to put a little loop of something to do so. As it’s been sitting on my desk, my children like to come put their hands in it, either to marvel at how much smaller than their hands their father’s hands once were or to free Mars. 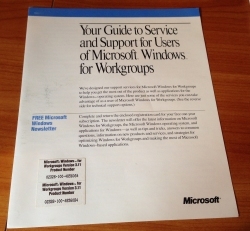 A flier with support information for Windows 3.11. This has probably been carried along in a box for twenty some years; my mother had a Windows 3.11 machine that probably came to me when she upgraded, and I have a refurb laptop with Windows 3.11 on it even today. I think I have the installer somewhere around here if I ever get a crazy itch to install it again. 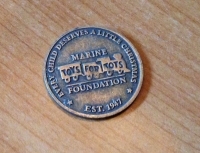 A Toys for Tots Foundation coin. It’s the strangest thing. This came in the mail with a fundraising appeal, and although I didn’t give them any money, I kept the coin. I dunno what I was thinking. The boys would play with it? Regardless, the boys are aging out of the part of their youth where they’ll happily play with some metal coin. Yet, I can’t throw it out. So it sits on my desk until the next cleaning frenzy, where I’ll put it in a box with other assorted tchotchkes. You hardly ever see hand held games at garage sales any more; certainly none of the electronic blip games from the 1980s. 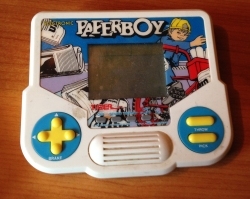 If any, you’ll find a little LCD screen game like this. I did, and I have yet to mount it on the wall. Sometime when I have a spare moment that I’m not wasting writing an inconsequential blog post, I’ll do just that. The children have brought these to my office because the battery terminals are corroded. “They have battery acid,” is how they put it. One of these days, I’ll get to it when I Set My Mind To It. Until then, they’ll rest easily underneath a pile of other junk. Sadly, that only scratches the surface. But you can’t write much about a clean desk. 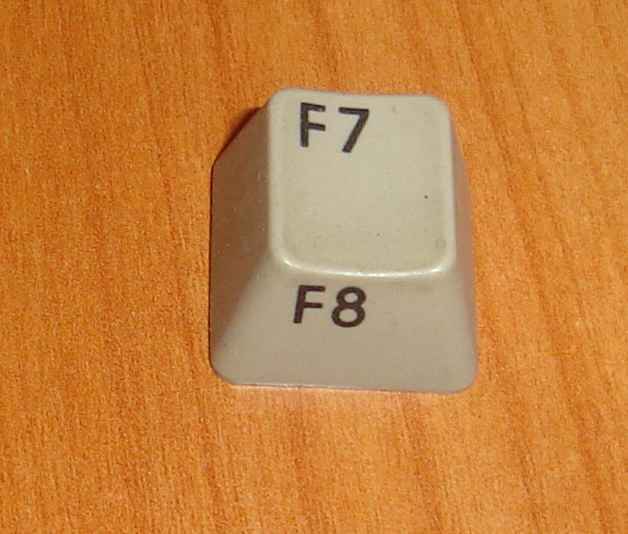 A Commodore 128 function key. When Triticale gave me his old Commodore 128 those many years ago, before he passed away, it was not in pristine condition. Its power supply needed a new fuse, and one of the function keys was detached. It’s still detached, obviously, but for some reason I tucked it into a catch-all box or bin sometime instead of packing it with the Commodore 128. Now that I’ve shamed myself on the Internet, I’ll see about that. Maybe. A commemorative name plate recognizing my aunt’s 25 years of service with Ralston Purina / RalCorp. 25 years with the same employer? Who does that any more except government employees? Of course, she didn’t do it now, she did it back then. I don’t know what that is. 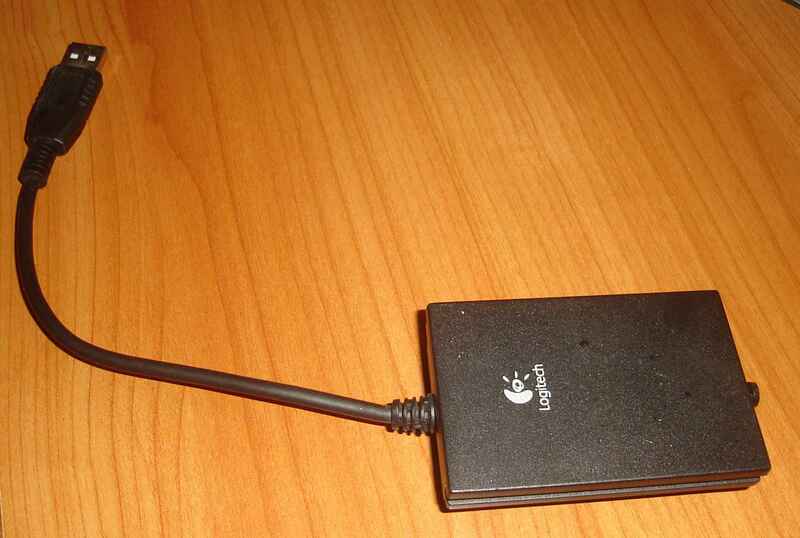 I’ve got so much Logitech junk around here that’s not plugged in. This has probably come out of a junk box where I threw miscellaneous cords when moving or something. It’s not vital to normal daily computer operations, obviously. 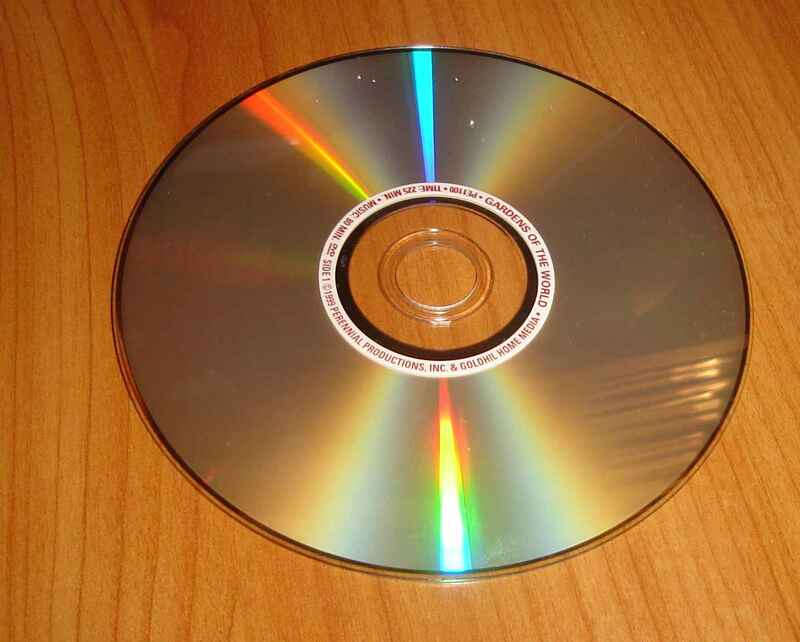 A DVD of the PBS series Gardens of the World. I’d used this to test the DVD player of the media station here in the office. It works. I didn’t watch a complete episode, though. I have started the episode on roses, though, since I have that on videocassette, too. In the series, Audrey Hepburn wanders around spouting poetry and quotes about plants, and then they cut to slow moving video of gardens with the type of plants highlighted in the episode. PBS sure does these things slowly, doesn’t it? The pace of the episodes are far slower than similar programs on commercial stations. The word CAR in Scrabble tiles and transparent tape. For my 26th birthday, my then-girlfriend Heather got me two bookcases to help store my growing collection of books in my mother’s basement. They marked my second and third bookcases. As they were too small to fit into her Ford Tempo, she (my then-girlfriend Heather, not my mother) ordered them to be delivered the Monday after my birthday. She taped the words, built from Scrabble tiles (we played a lot of Scrabble, that young lady and I), TWO BOOKCASES TOO BIG FOR HEATHER’S CAR onto a piece of cardboard and wrapped it for me. I still have those bookcases and at least one of the words from the wrapped gift. The then-girlfriend I transmogrified into a wife. A 2 fluid ounce bottle of Plaid acrylic paint, Raspberry color. Back when I first started beading in 2009 or whatever it was, one of the first thoughts I had was to make a peppermint bracelet with red and white seed beads wrapped around each other but joined by peppermint disks. I bought white disk beads and a peppermint color paint (Raspberry, actually), but I never painted those disks. I keep meaning to take this bottle up to the garage and put it in with the other acrylic paints, but it falls behind another pile or something and remains on my desk. A gallon-sized bag filled with spoons. These spoons were once my mother’s spoon collection. I’m not sure when they last graced her walls, but I inherited them when she passed away almost three years ago already. For a while, I’ve been moving around the display rack in which these spoons hung on the wall in our apartment in the projects, and I recently uncovered the spoons when I was cleaning my garage. So, of course, I can’t lay my hands on the display rack right now. When I find it, I’ll polish the spoons and hang them on my dining room wall. A Monroe Monro-matic CAA-10 calculator from 1954. I bought this at a garage sale or estate sale some nine or ten years ago, and I’ve had it in my storeroom for some time. Unfortunately, it doesn’t fit in the narrow cabinets I have in there, so when I last reorganized my storeroom last autumn, I brought it into my office and it’s sat upon my desk or under my desk for a couple months while I try to decide what to do with it. Maybe I’ll learn how to use it. More likely, I’ll shuffle it around my office until I return it to the storeroom or the garage. 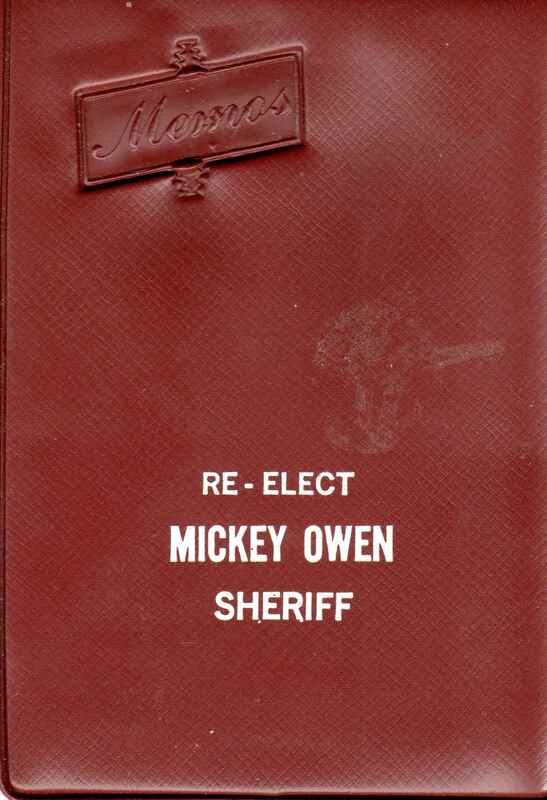 A re-elect Mickey Owen memo pad. I don’t know who Mickey Owen was, nor how old this memo pad is, but I paid a dime for it at a church garage sale here in Springfield. I haven’t yet written any memos in it, and I’m not sure if I will. 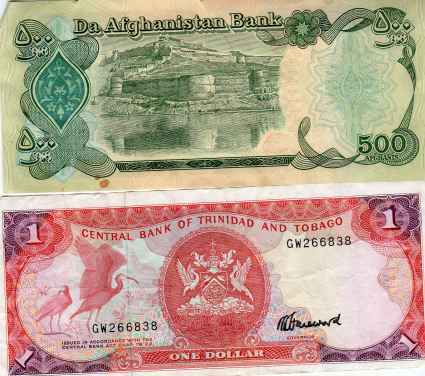 It will ruin the collectible value. One Hohner Golden Note harmonica in C. I got a toy harmonica as a high school graduation present from Tim and Pixie. When I got to Milwaukee, I bought a Hohner C harmonica and tried to teach myself to play. I learned a couple short songs, but never became really adept at it. After graduating from college and after having not really practiced in a couple years, I bought two new Hohner Cs at Nottlemann Music and haven’t really practiced with them much at all. But this one is on my desk, reminding me of my failings. By naming these things on the blog, I do tend to handle them in short order, which is why I’m bothering you with them. One green binder containing hundreds of rejection letters for my writing efforts over the last 20 years. One silver butter tray, tarnished. One 36 Caliber Navy Model pistol, an expensive Italian import, I think. One Blip the Digital Game awaiting cleaning and mounting on the wall. One cute little 6″ by 6″ decoration depicting a kitten painted on what looks like window blinds and adorned by a little pink bow not awaiting mounting on my wall. These things were deposited by me onto this desk months ago because I need to take a couple minutes to clean them or whatnot. Instead of doing that, I’ve posted on my blog, and soon enough a blizzard of paper to file and act upon will cover them again until the springtime.